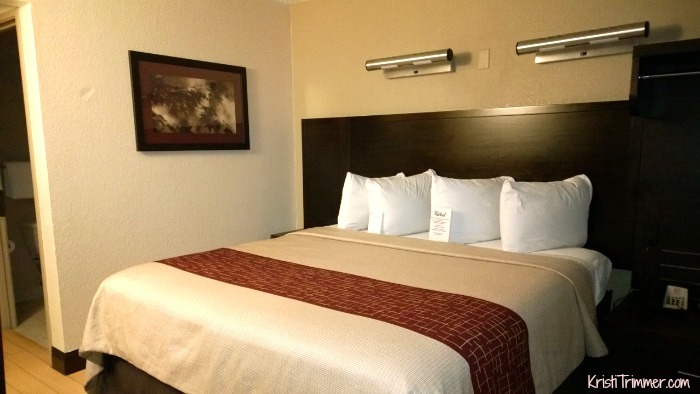 On my recent trip to Sacramento I was able to stay at the Red Roof Inn in Elk Grove, which is just outside Sacramento. I’ve stayed in Red Roof Inns over the last few years while road tripping. They are a budget hotel that can be hit or miss. I was pleasantly surprised to hear that Red Roof Inn has been renovating some of their properties to be Red Roof Inn Plus properties. What I noticed when I went to the Elk Grove location where some of these new amenities. The lobby looked upgraded, there was a separate dining area where the complimentary breakfast was served. Starbucks coffee and tea were available 24 hours. Upon check-in, I received two bottles of water – which I needed as I was parched! The front desk clerk was very nice and really made me feel welcome. 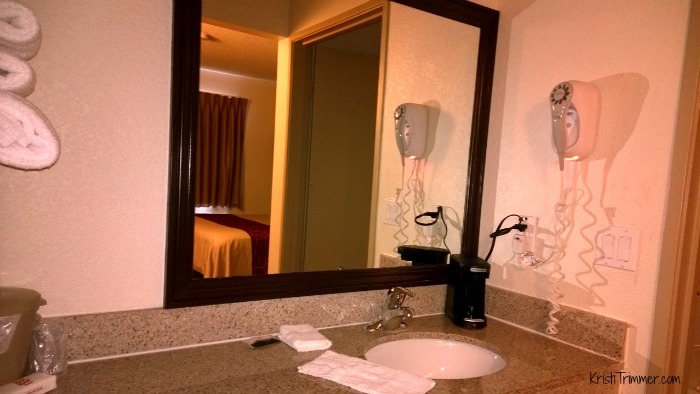 The outside looks like a typical budget hotel, but let me tell you about the inside. It blew my expectations with one glance. I loved the modern feel, the king size bed that was oh so comfy (later found out it was a Serta), and the flat screen TV was a nice touch. I’m a sucker for hard wood floors so I really liked that they had faux wood floors instead of carpet. With all the beer blogging I have been doing lately, have a full-size mini fridge was perfect to hold some of my bounty. As a techie I was happily surprised to see the extra electrical outlets as my devices needed to be charged up. The WiFi was fast which is often a big issue for me. One thing to note though is that because this Red Roof sits on a major road there is a bit of traffic noise. I just put on some music and I didn’t mind it at all. If you are sensitive to sound, make sure to ask for an interior room. Disclosure: I received two nights at the Red Roof Inn in exchange for this review. That doesn’t change the fact that their updated rooms are pretty sweet and I would stay there again in a heartbeat. I will be looking for their Plus properties as I continue traveling. Links within this post may contain affiliate links that I earn commissions from. This is how I pay for my travels and this blog. « Alaska Bound: I Saw a Black Bear! If you find yourself traveling on interstate 75 in Georgia, we have a suprise for you. Stop by the Red Roof Inn Atlanta/Southeast Stockbridge GA and say HI. We would love to have you stay with us.